THE IRISH GOVERNMENT has issued advice to pet owners who plan to travel to the UK with their cat, dog or ferret after 29 March and the UK leaves the EU without a deal. The Department for Agriculture Food and the Marine has issued advice that covers three scenarios: going on holiday in Great Britain with your pet, moving to Great Britain with your pet, or travelling from Great Britain to Ireland with your pet. 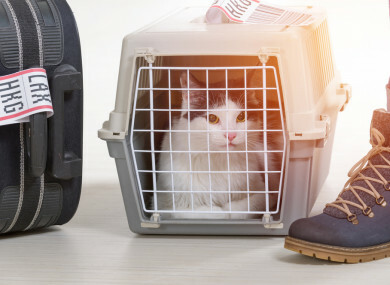 In all cases, it’s advised pet owners looking to travel should contact a vet as soon as possible before setting off to make sure all necessary arrangements are in place. With the UK due to leave the European Union on 29 March, a no-deal scenario is more likely than ever. A series of votes are to happen in the House of Commons next week where it’s hoped will clarify what UK parliamentarians want, in order to break the current political deadlock. Meanwhile, the UK Attorney General and the EU are trying to hammer parts of the current Brexit Withdrawal Agreement into a shape that would be slightly more pleasing to British politicians, without changing the essence of the deal, which has been approved by the other 27 EU member states, including Ireland. Dogs will need to be given treatment against tapeworm by a vet, before re-entering Ireland. Anyone bringing a pet dog, cat or ferret into Ireland from Great Britain will have to give the Department of Agriculture, Food and the Marine advance notice by email before arrival. *For return to Ireland, you’ll need an EU pet passport (not a UK-issued EU pet passport) or an EU health cert issued by a UK government vet. You will not be able to return to Ireland on an EU pet passport issued in the UK, but you should hold on to a UK-issued pet passport if you have one, as it may have important information about vaccinations and other treatments. **You must wait at least 30 days after the rabies vaccine was administered before the blood test can be carried out. The Department emphasised that you should arrange this test in Ireland before you travel. This is because if the test is administered in Great Britain after 29 March, the pet would have to wait three months from the date the successful rabies titration test was carried out before it can travel to Ireland. If you’re moving to Great Britain with your pet and not returning to Ireland, the situation is mostly in the UK’s hands, so you might need to wait and see what kind of Brexit we get, and what the UK government says you’ll need to enter. The UK Government have indicated that pet travel rules for entry into the UK may not change for some time after Brexit, but you must check with the UK authorities for the latest information. **You must wait at least 30 days after the rabies vaccine was administered before the blood test can be carried out. If the test is administered in Great Britain after 29 March, the pet would have to wait three months from the date the successful rabies titration test was carried out before it can travel to Ireland. ***You will not be able to travel to the EU on an EU pet passport issued in the UK, but you should hold on to a UK-issued pet passport if you have one, as it may have important information about vaccinations and other treatments. You can find more information on the Department website here. Email “If you plan to travel to the UK with your pet after a no-deal Brexit, here's what you'll need”. Feedback on “If you plan to travel to the UK with your pet after a no-deal Brexit, here's what you'll need”.